Aditya BIRLA SUN LIFE PURE VALUE FUND plies the value investing trade and strictly remains true to the given mandate. Given the value bias, the fund takes a bigger bite of the mid-and small cap basket, where under-priced opportunities are more. Contrarian, out-of-favour bets that offer high margin of safety but enough growth drivers are a mainstay of the portfolio. The fund manager is always on the lookout for new value ideas, which often results in a higher portfolio turnover. He is comfortable taking concentrated exposure in his high conviction bets, and takes a pure bottom-up approach to stock selection, with no market cap or sector bias. It boasts among the highest alpha in its category, but is also accompanied by higher degree of volatility. However, its execution capabilities are proven, making it a worthy bet for the long run. Franklin India FlexiCap Fund – Interest in large-sized companies is expected to go up in the coming quarters given their strong balance sheets, dominant market share and relatively better ability to deal with changes that affect the ways of doing business. Franklin India Flexi Cap is geared well to cash in on investment opportunities in large-sized companies and suits well for long-term investors with an investment horizon of 3-5 years. One notable feature of this scheme is its consistency of performance. The scheme is modelled after Franklin Templeton’s philosophy of selecting companies without sacrificing on attractiveness of valuations. Also the scheme’s fund managers R Janakiraman, Srikesh Nair and Lakshmikanth Reddy adhere to the fund house’s philosophy of choosing companies which have strong business models, competitive advantages in their respective sectors, and quality management. They are also open to selecting companies which may seem out of favour but perform well in the long-term. The scheme has consistently beaten its benchmark Nifty 500 and performed reasonably good against its peers. In the past threeyear and five-periods, the scheme has given 11.2% and 18% respectively while its benchmark Nifty 500 has given 11% and 14.5% respectively in the same period. In the past six months, the scheme’s fund managers have bought in companies which to a large extent are dominant players in their respective sectors and have also not run-up as well in 2017. IDFC Tax Advantage (ELSS) Fund scheme seeks to build a diversified portfolio comprising of stocks of companies with strong fundamentals that are available at reasonable valuations. The scheme can be fully into equities (and equity related securities) and upto 20% in debt & money market instruments. IDFC Tax Advantage (ELSS) Fund is a fund which has earned its stripes by beating its benchmark every year except the first one (2009). This performance has earned it a three to four star rating for much of its life. This fund is among the more aggressive ELSS choices. The portfolio shows an 8 to 11 per cent allocation to small-caps at all times while mid caps have made up anywhere between 25 and 40 per cent of the portfolio. Large-caps have accounted for the residual portion. IDFC Tax Advantage (ELSS) Fund is managed on the basis of the growth at a reasonable price philosophy. It does take both cash and debt calls on occasion, though the cash position is fairly low at present. The fund believes in identifying companies based on a deep understanding of the industry growth potential and interaction with managements. IDFC Tax Advantage (ELSS) Fund is yet to be tested in a severe bear market, as it was launched after 2008. Its record in 2011 showed an ability to contain downside. The fund has beaten its benchmark by sizeable margins of 6 to 7 percentage points over three and five years. After a blip in 2016, it has made a huge comeback, trouncing both its category and benchmark in 2017. The higher mid and small-cap tilt, however, may peg up volatility. Investors can take smaller exposures to this fund until a longer track record is at hand. After scorching performance charts for many years, this fund has seen a blip in its return profile recently, even as it attracted huge inflows during this period. The fund manager continues with the same proven approach focusing on quality stocks with scalable business models and has strictly avoided beta-driven plays–picking stocks that move higher, in either direction, in relation to the market–which have been preferred by the market of late. He continues to run a concentrated portfolio, even with a larger corpus. The only change in the portfolio is the higher tilt towards large caps, taking cognizance of higher valuations in mid-caps. Investors should avoid exiting the fund on its recent performance and monitor its performance over the next 6-12 months. KOTAK OPPORTUNITIES FUND has a track record of consistent outperformance. It takes a flexi-cap approach, but with a clear large-cap focus–65-70% of the portfolio. The fund adopts a pure bottom-up stock selection approach with no sectoral constraints. The fund manager prefers companies that promise consistent cash flows, have a proven business model and an efficient management, and are available at a reasonable price. He seeks to limit risk through diversification, with a portfolio comprising around 60 stocks. The fund limits exposure even in its top picks. Further, within its mid-cap exposure, it puts a heavy emphasis on liquidity. With a proven ability to capture higher market upside and cushion downside better, KOTAK OPPORTUNITIES FUND is a worthy bet in the flexi-cap segment. Birla Sun Life Balanced 95 Fund was labelled as one of the most consistent and steady funds in the balanced fund peer set. The fund has beaten its benchmark over all the last 10 years. The fund is suitable for those investors who wish to generate equity oriented returns at lower level of risk. v Prudent asset allocation is key to wealth creation in long run. BSL Balanced 95 fund provides judicious mix of Equity & Fixed income in your portfolio and helps to minimize losses as fall in one asset class can be made up by rise in other. v A great proposition to invest across market phases and especially now, when interest rates are falling and growth is gradually increasing; both the asset classes are expected to do well. v Fund has a successful track record of more than 20 years. There are only 4 more balanced funds with a track record of more than 20 years. 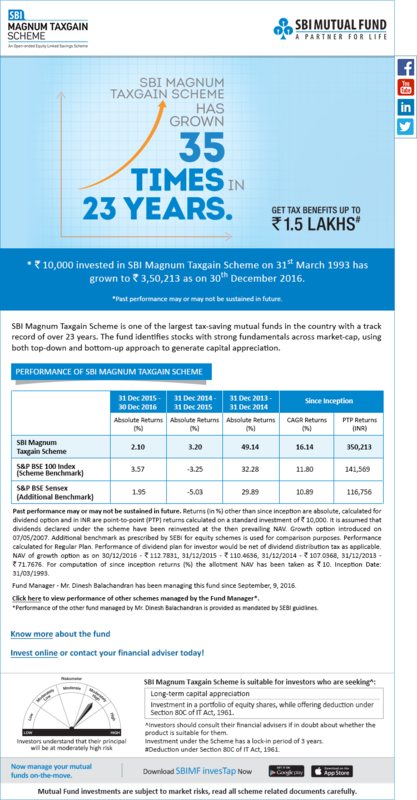 Since inception the fund has generated superlative returns of 20.88% (as on 31st March 2016). v CIO managed fund – Mahesh Patil (CIO – Equities), who also manages our flagship funds like BSL Frontline Equity and BSL Top 100 is the manager of this fund. All of Mahesh’s funds are in top quartile of their peer group. v Fixed income portfolio is managed as mix of accrual and duration strategy. Birla Sun Life AMC has been known for fixed income fund management. v Equity allocation tends to be multicap. While 2/3rd equity portfolio is in large caps and rest in small & midcap stocks. The Fund invests in companies which have secular growth prospects and are available at reasonable price. It basically focuses on bottom up selection for generating alpha. v Quarterly dividend Policy – already paid out 4 dividends over last fiscal year. We intend to follow this policy in this Financial year as well. v Since inception the fund has declared more than 28 dividends over 21 year period. Cumulative dividend paid out is Rs 109 per unit. v An SIP investor in the fund would be a “Crorepati” proposition with an investment of Rs.10,000 per month in the fund since inception grown to Rs.3.39 crs at an XIRR 20.79%. (as on March 2016). v BSL Balanced 95 Fund has outperformed Nifty across market phases and Debt indices across market phases & majority of interest rate cycles. 1. Investment Illustration since inception of this scheme, 27th May 1999. 2. Portfolio as on 30th April 2017. 3. One pager as on 31st March 2017. How is a dynamic equity fund different from a diversified fund? Most diversified equity mutual fund schemes are fully invested in stocks as per their mandate and do not take any cash calls. Dynamic equity funds invest in a mix of debt and equity. They increase/ decrease their allocation to equities and debt depending on their view of the stock markets. Typically, when stock markets fall they increase equity in the portfolio and when they are up they reduce it. The equity component of the portfolio would vary depending on the method of calculation used by the fund house. A fund house is free to use its own methodology for calculation this. A fund could use the Nifty PE, price-to-book value or any other in-house proprietory models to allocate. Why do many financial planners recommend these to first-time equity investors? Many first-time equity investors are not used to volatility in the equity markets. They are moving money from fixed deposits to equities. In case the markets were to correct, a portfolio with a mix of debt and equity would face lower volatility than a pure equity fund portfolio. This would give them a better experience instead of diversified equity funds, believe financial planners. What are the pros and cons of such funds? Dynamic equity funds automatically rebalance portfolios and hence it is recommended for first-time equity investors. If the market was to enter a corrective mode, dynamic funds with a lower allocation to equities could see a lower erosion in their net asset value (NAV) as compared to a pure equity fund. Since dynamic equity funds tend to hold higher debt when equities surge in prolonged rallies as we saw in 2017, they could underperform diversified equity MFs. Essentially, lower volatility could end up giving lower returns in prolonged bull markets. How are these funds treated from a taxation perspective? One huge advantage of these dynamic funds is that they are structured in such a way that they are taxed as equity funds for investors. Most funds when they lower their exposure to equities, ensure that the equity plus arbitrage component of the scheme is at least 65 per cent of the corpus, which helps it qualify for equity taxation. As per the new tax laws from the next financial year, investors will have to pay as much as 10 per cent long-term capital gains tax if they sell their units after holding them for one year. Mutual fund withdrawals are subject to tax depending on the category of the funds you own. Debt funds and equity funds are taxed differently. Systematic Withdrawal Plans (SWP) redemption is as per first in first out (FIFO) method wherein units first bought are assumed to be redeemed first. Hence your costs for the purpose of taxation will be considered as per FIFO method. If you redeem/withdraw your investments in equity mutual funds after 12 months, your investments would qualify for long-term capital gains tax which is nil at the moment. If you sell your equity mutual fund investments before 12 months, you will have to pay a short-term capital gains tax at a flat rate of 15 per cent. Debt mutual funds qualify for long-term capital gains tax only if investments are held for three years. The long-term capital gains tax on debt funds is 20 per cent with the inflation indexation benefit on your original investments. If debt mutual fund investments are sold before three years, the short-term gains are taxed as per your applicable Income Tax slab. Your SWPs will also be taxed as per the above rules. Based on your requirement and tax slab you can plan your SWP accordingly.